Pranab Mukherjee said Narendra Modi had a "unique capacity to work very hard", combined with vision and determination. 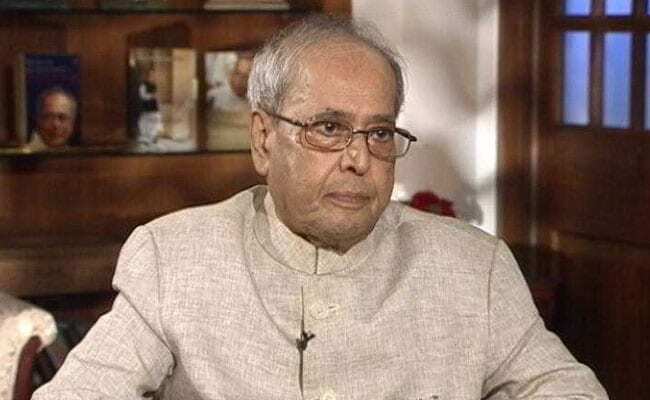 New Delhi: Pranab Mukherjee, who in his four-decades of public life has worked with four Prime Ministers, today had warm praise for Narendra Modi. But he expressed reservations about the goal the BJP has adopted - that of a Congress Mukt Bharat (Congress-free India). The former President and Prime Minister had shared cordial relations - one that was reflected in their warm praise of each other when Mr Mukherjee demitted the nation's highest office. Today, in an interview with NDTV, the former President, who now calls himself a citizen of India, said Mr Modi had a "unique capacity to work very hard". This, he said, was combined with a strong determination to achieve his objectives and clarity of vision. The Prime Minister, Mr Mukherjee said, knows what he wants to achieve and he works hard to achieve that. PM Modi, he said, had captured the intricacies of administration, political dynamics and foreign policy without any exposure in Parliament. "One should remember, it was not easy for him coming straight from the state not even serving the Parliament as a member for few years..." Mr Mukherjee said. Recalling those early days in Delhi, PM Modi had expressed gratitude for the guidance provided by Pranab Mukherjee. At the launch of a book authored by Mr Mukherjee in July, the Prime Minister had said, "Pranabda ki ungli pakadake Delhi ki zindagi mein apne aap ko set karne me bahut badi suvidha mili (I was fortunate to get Pranab Mukherjee's guidance while settling down in Delhi)". Citing an example of Mr Modi's grasp of neighbourhood relations, Mr Mukherjee said ahead of taking oath as the Prime Minister, he had suggested that the heads of SAARC nations be invited for the ceremony. "This was a unique suggestion and I readily agreed," he said. Mr Mukherjee had earlier said their divergences did not affect their working relationship. In his farewell speech as President, he said the Prime Minister was "driving transformational changes" in the country with "passion and energy". He had also shared the Prime Minister's farewell letter to him on Twitter, saying it had "touched" his heart. Known for speaking his mind without overstepping the boundaries of the constitution, the former President today expressed his reservations about the aggressive BJP campaign to oust the Congress from every state in India. Mr Mukherjee said he did not "personally subscribe" to the idea of getting rid of a political party in a multi-party democratic system. "Every political party has come to stay, play its role depending on their acceptability of their philosophy, ideology to the people of this country," he said.